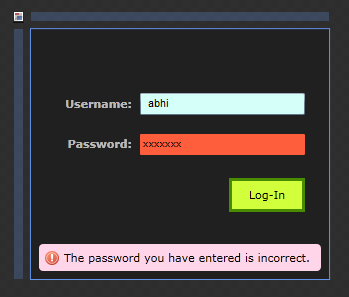 When you hover over the Log-In button, which elements do you think receive notification of something happening? One of the elements that gets notified is the button, as you would expect. What you may not realize is that the event propagates beyond the button and to other elements in its visual tree such as its parent, its parent’s parent, and so on. That roundabout way of having events routed through the parents is what makes events in WPF and Silverlight known as routed events. The application portrayed is fairly simple. 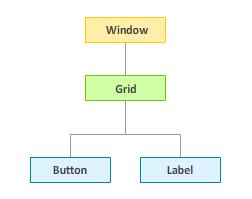 It contains a Button and Label (aka TextBlock in Silverlight) control nested inside a Grid control which, in turn, is hosted by our overall Window/UserControl control. When you hover over your button, since the hover is a routed event, your MouseEnter event gets recognized by your Grid and Window/UserControl controls. Peers are not affected. You interacting with your Button will have no affect on the Label control that is your peer. This is true even if your Label is overlapping your button. Since your Label/TextBlock is never hovered over and it is a peer of your button, it doesn’t partake in this event handling festivity! While I mentioned that your events get recognized by the parents, the order by which they get recognized depends on the routing strategy used. The two most popular routing strategies are bubbling and tunneling. 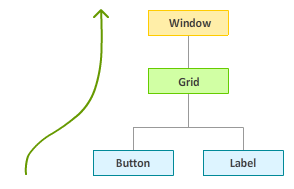 This is what I described earlier where the order of the elements that get notified by an event on the button goes from Button to Grid to Window. The tunneling strategy works in the opposite way. For most of the other events that do not have Preview in front of them, you are dealing with bubbling events. Silverlight only supports bubbling, so you will always have events that move up to the root as opposed to starting with the root and moving down. 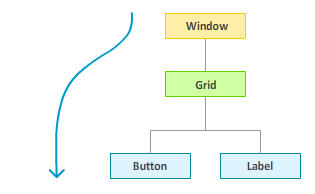 The UIElement class defines many routed events for keyboard, mouse, and stylus input. Most of these are bubbling events, but many of them are paired with a tunneling event. Tunneling events can be easily identified because, by convention, they are named with a Previewprefix. These events, also by convention, are raised immediately before their bubbling counterpart. For example, PreviewMouseMove is a tunneling event raised before the MouseMove bubbling event. Where is the event for handling the pressing of a mouse’s middle button? If you browse through the various mouse events exposed by UIElement or ContentElement, you’ll find events for MouseLeftButtonDown, MouseLeftButtonUp,MouseRightButtonDown, and MouseRightButtonUp (as well as the tunneling Preview version of each event). But what about the additional buttons present on some mice? This information can be retrieved via the more generic MouseDown and MouseUp events (which also have Preview counterparts). The arguments passed to such event handlers include a MouseButton enumeration that indicates which button’s state just changed: Left, Right, Middle, XButton1, or XButton2. A corresponding MouseButtonStateenumeration indicates whether that button is Pressed or Released. F*ckin’ tremendous issues here. I am very happy to see your post.